Customers can avail from us a wide range of Slat Conveyor, which is designed & developed incorporating highly advanced technology. The conveyors made available in this range meet the prevailing industrial standards and clients' application requirements. Our slat conveyors are highly appreciated in the market for their durable finish standards and resistance to corrosion. 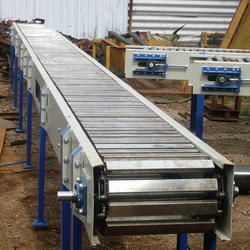 We provide these conveyors in standard as well as customised designs. We offer Slat Conveyor in a wide variety of specifications and capacities to the clients. The material handling equipment manufactured and supplied by us in this range is used for assembly line and production operations. These slat conveyors are highly appreciated in the market for their optimum quality standards. 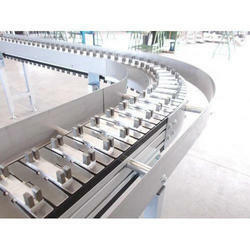 Looking for Slat Conveyor ?